This is a very simple summer pasta recipe. It's little more than noodles, chicken, garlic and fresh herbs--lots of fresh herbs. If you have an herb garden, it's probably producing at its peak right now, given you a bounty of basil, parsley, chives, mint, etc. You can use any combination of herbs you like here and it will probably be delicious. I used mint, Italian (flat-leaf) parsley, basil and chives. I'm sure chervil would be good here, as would thyme and rosemary. Want this to be vegetarian? Omit the chicken and maybe substitute some mushrooms. 1. Bring a large pot of salted water to boil. Cook pasta according to package directions for al dente. Reserve 1 cup of pasta cooking water, then drain pasta and set aside. 2. Heat olive oil and butter in a large deep-sided skillet over medium heat. Add the chicken, season with salt and pepper, and pan-fry until the chicken is browned and cooked through, turning over after about 5 minutes. Remove chicken and transfer to a cutting board. After a couple minutes, chop the chicken into 3/4-inch pieces. 3. Add the garlic and lemon zest to the pan. When fragrant, add back the cooked chicken, reserved pasta cooking water and lemon juice. When the mixture simmers, reduce heat to medium-low and add the pasta, herbs and 1/2 cup of the grated cheese. Stir to combine all the ingredients. 4. 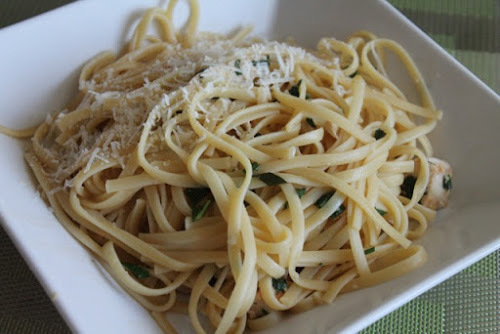 Serve the pasta in shallow bowls with the rest of the grated cheese spooned over it.